Engaging, well acted and ultimately moving drama about learning to live with the past, though some of the subplots get short-changed by the various time jumps. Directed by Jeremy Podeswa, Fugitive Pieces is based on the best-selling novel by Anne Michaels and stars Stephen Dillane as Jakob Beer, a man whose life is haunted by his childhood experiences in WWII, to the extent that his obsession costs him his first marriage to the vivacious Alex (Rosamund Pike). Flashbacks show the young Jakob (Robbie Kay) fleeing the Nazis after the murder of his parents and being taken under the wing of kindly Greek archaeologist Athos (Rade Sherbedgia), who smuggles him into Greece. Meanwhile, flashbacks to a different period reveal the grown-up Jakob (Dillane) living in Canada with Athos, with the two of them working on a Holocaust memoir. However, Jakob is continually haunted by dreams of his long-lost sister Bella (Nina Dobrev) but it isn't until he meets and falls in love with museum curator Michaela (Ayelet Zurer from Angels & Demons) that he begins to finally let go of the past. The performances are excellent: Dillane is superb as the withdrawn, haunted Jakob, while Rosamund Pike brings a much needed spark to the early scenes. 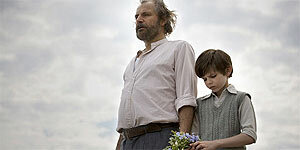 Similarly, Rade Sherbedgia is on reliably brilliant form as Athos, while child actor Robbie Kay gives a terrifically expressive, largely mute performance as the young, traumatised Jakob. The editing of the film is curious, in that it works well in some places and not so well in others – for example, the first shot of Rade and Dillane together is meant to be a sort of flowing together of the two timelines, but it's incredibly jarring, largely because there's no teenage actor for Jakob, so his teens are entirely absent. Similarly, the various time jumps mean that a sub-plot involving the son (Devon Bostick, then Ed Stoppard) of Jakob's Holocaust survivor neighbours is left frustratingly under-developed. Fugitive Pieces is an emotionally engaging, well written drama with strong performances. Worth seeing.